Where will be held the festival, and how to get there? The Festival will be held in a campground located between the villages of Jubrique and Algatocín, two typical white Andalusian villages, located in the Genal Valley. The campground is on the Genal River, known in the region for the quality and the quantity of its waters. You will be amazed to find such green luscious scenery and so much water after traveling through the rest of Andalusia and Spain at that time of year. The Genal Valley is renowned for the quality of its environmental preservation, and provides an important year-round water supply allowing vegetation and rivers to thrive, even at the end of the summer. To come join us,the closest airport is in Málaga, with daily flights from all over Europe. We will organize a shuttle from the airport to the Festival (about 3 hours ride), so that you do not have to worry about the trip from the airport, and so that you can start meeting people. 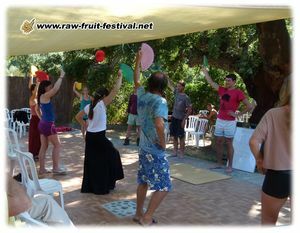 You can also come by train to Ronda, then take the daily bus Ronda-Algatocín-Genalguacil-Jubrique, leaving Ronda at 13h45 and arriving at the festival at 15h. Please note that the bus does not run on weekends. Otherwise, you can come on your own (car, bike, ...), but keep in mind that this is a mountainous region. Near the festival, two large natural swimming holes are within walking distance, for a swim at an incredible site. Nearby also, you will find a lot of trails to go for a hike or a run among cork oaks and chestnut forests. The area is known for its white villages (pueblos blancos), set on the mountain slopes, and quite isolated one from the other, yet the old traditional walking paths between them still remain. In the area, you can visit several interesting tourist sites. Near Ronda, La Cueva de la Pileta is the last cave with prehistoric wall paintings open to the public in Europe. 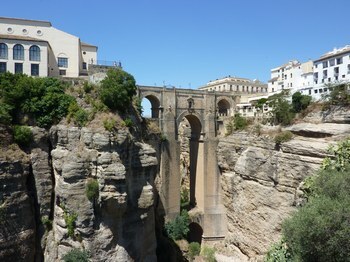 Ronda, the ancient Moorish capital in the region, offers great views from its rocky vantage. The “new bridge” (built in the 16th Century), set on a deep narrow chasm on the edge of a cliff, is iconic and spectacular. The old Arab baths have been restored and are among the best ones open to the public, allowing visitors to experience the way these baths functioned. Granada is, of course, the most famous destination in the region. It features the Arab palace, the Alhambra, with amazing architectural features, like the timber-frame work, and spectacular gardens. The Mediterranean coast is close by, an hour’s drive away, with breathtaking views of Gibraltar and Morocco along the way.